The federal funds rate – typically referred to in the press as “the fed funds rate” – is the rate at which banks with balances held at the Federal Reserve borrow from one another an overnight basis. Banks are required to hold a certain amount of capital in reserve: 10% of the deposits they hold at the end of each day. Some banks finished the day with surpluses, while others will fall short of the required amount. The fed funds rate is the rate at which the banks in deficit borrow from those with a surplus. 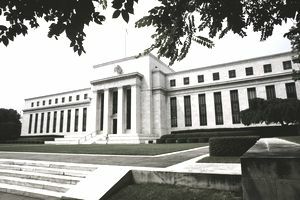 The Federal Open Market Committee (FOMC), is a committee within the Federal Reserve that is best known for its role in “setting interest rates.” The terms “Fed” and “FOMC” are typically used interchangeably in the financial press. In practice, the FOMC doesn’t actually set rates – banks negotiate between one another to determine the overnight borrowing rate. What the FOMC does do is set the federal funds “target rate” – which is its desired overnight borrowing rate. It achieves this by managing the money supply, which it achieves by buying government bonds (which injects money into the banking system) or selling them (which takes money out of the system. The FOMC targets interest rates in order to achieve its “dual mandate” or maximizing employment and minimizing inflation. The committee meets eight times a year to discuss rate policy, but it will sometimes hold special meetings if extraordinary conditions warrant. When the committee wants to support economic growth, it sets its target rate low. The lower the cost of money, in theory, the more likely individuals and businesses will borrow to fuel projects – like the construction of a commercial property, which in turn would put people to work. When the FOMC wants to reduce inflation, it can do the opposite: raise interest rates in order to curb growth. How Does the Federal Funds Rate Affect the Economy? The fed funds rate is critical to the economy in that is the key determinant of the prime rate, which is the basis for the loans taken out by most individuals. It also influences the rates banks pay to depositors, and it is the basis for the yields at which short-term government bonds trade in the market. Typically, a falling federal funds rate – or the expectation that it will fall – is a positive for both stocks and U.S. Treasuries unless it is the result of a crisis such as that which occurred in 2008. A rising fed funds rate is generally a negative for stocks (by slowing growth) and government bonds (by causing yields to rise – and prices to fall - for shorter-term issues, which in turn influences bonds of all maturities). This is a general rule, by no means is it always the case. The federal funds rate has ranged as high as 20%, in 1980, to as low as 0% - 0.25%, the range set by the FOMC in December, 2008. Why has the Fed set rates so low?